Few scholarly pursuits seem as visually arresting as archaeology: archaeological sites are often located in idyllic settings, artifacts can be captivating, archaeology labs invoke the power of science, and archaeologists routinely illuminate fascinating experiences. The compelling and often spectacular aesthetics of archaeological sites and artifacts make archaeology a staple for the press and a broader range of popular discursive spaces like blogs and video. Yet for some scholars the stereotypical visual representations of archaeology in the media reduce complex scholarship to its most hackneyed aesthetics. For some archaeologists, the focus on particular sorts of images betrays a deep-seated media (if not popular cultural) ignorance of all the complex nuances of archaeological interpretation. For some archaeologists the press and popular commentators inevitably distill archaeological scholarship to shallow and simplistic points whose liabilities and complications are glossed over by distracting if captivating images. 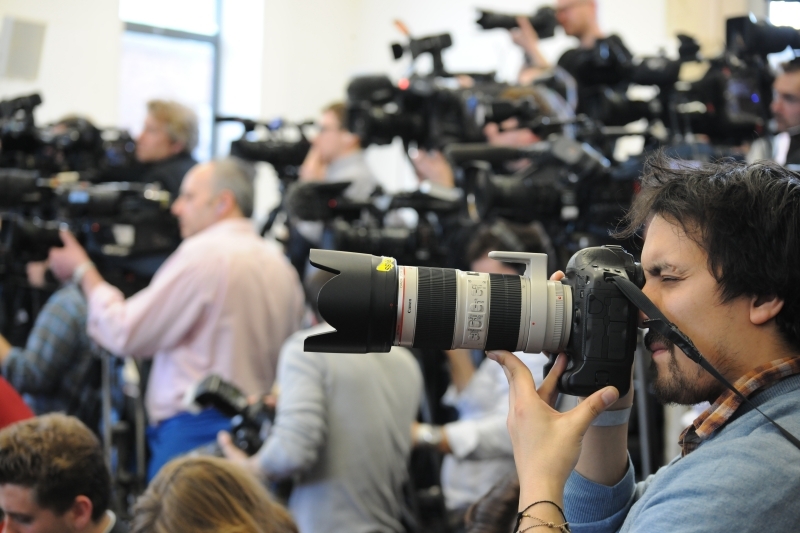 Richard III meets the press again after more than 500 years (courtesy University of Leicester). 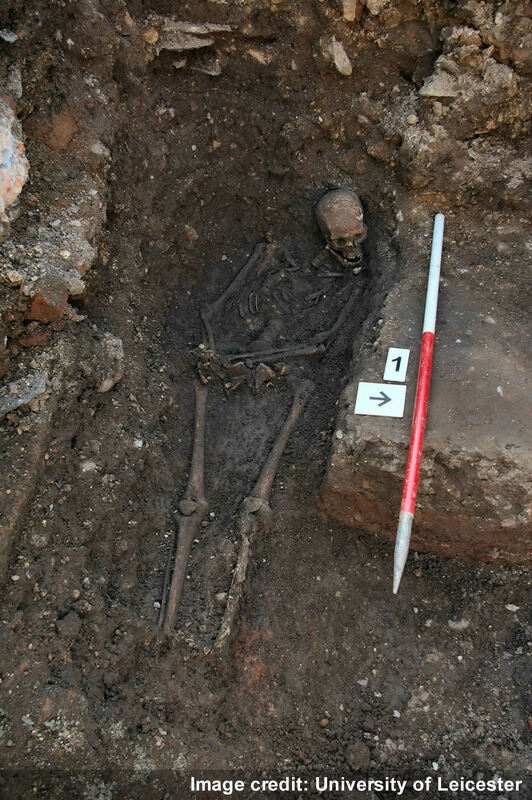 This has all been underscored in the last week since Richard III was recovered from a Leicester parking lot. Over a half millennium after he was dumped in a corner of a friary, Richard III has become a visual symbol of sorts, with images of the archaeological site, his corporeal remains, and his reconstructed visage suddenly familiar outside a tiny circle of academics. A google image search for Richard III turns up scores of Richard III paintings alongside images of his skull, facial reconstructions, pictures of the likes of Laurence Olivier, Ian McKellen, Kevin Kline, and Kevin Spacey portraying the lost monarch, Richard III memes, and even Richard III manga. What Richard III symbolizes in these representations is complicated: Richard’s images may be ambiguous signifiers for archaeology, science, and heritage, but much of the press coverage may represent nothing more than aesthetically arresting images and a fascinating if shallowly told story. However, there are some truly compelling reasons we are drawn to these remains that have more to do with our imagination about the past than shallow media theatre. The news coverage of Richard III has seized on predictable elements to weave a compelling story: the ignominy of a monarch’s remains residing haphazardly in a hole in a parking lot; Michael Ibsen—a 16-generations-removed descendant of Richard III—covering a swab with his DNA-soaked saliva so that science might confirm the fate of the long-dead King; the radar survey of the parking lot (oddly enough, supervised by re-enactors in period armor), which guided the well-placed excavation units; the emotionally involving images of battle wounds, Richard’s curved spine, and bodily post-mortem humiliation; and the chance to look “into the King’s eyes” through the facial reconstruction. 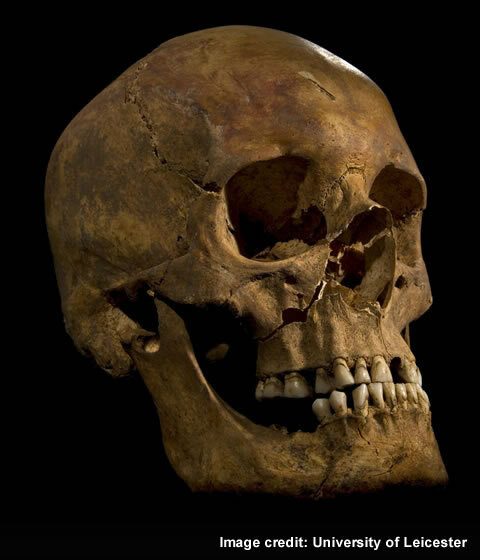 The excavated skull identified as Richard III (image University of Leicester). It is somewhat unfair to cast the Richard III narrative as a typical archaeological story: though this is hard for Americans to fathom, for the British Richard III is in many ways a mythic figure who has now been given a material form by archaeology. Richard III’s remains fan what Michael Shanks refers to an “archaeological imagination” mediating between past and present and turning these monarch’s bones found in a multicultural Midlands parking lot into a compelling narrative. They may be unique in their newly secured status as royal remains, but Richard III and the popular consumption of his new archaeological narrative illuminates many commonplace challenges of archaeological representation and underscores how archaeological stories secure a footing in public discussion. Much of the reaction against the Richard III archaeology revolved around the sense of archaeological theater crafted by the Leicester press conference. For instance, Times Higher Education questioned presenting the preliminary Richard III findings in a press conference prior to peer-review; The Guardian’s Paul Lay likened the press conference to “a cerebral X Factor” and suggested that the “University of Leicester, while rightly proud of the forensic skills of its archaeological team, has milked this for all it’s worth, abandoning impartiality”; and Cambridge historian Mary Beard skeptically tweeted over the historical relevance of the project and was answered by a hale of tweets critical of her apparent contemptuousness for the popular interest in the project. The science of recovering Richard III (courtesy University of Leicester). The discussion over how archaeology becomes part of popular discussion revolves around a few things raised by the Richard III project. First, it illuminates what we think is “significant”—for archaeologists, the friary and monarch’s bones may assume different meanings than they do for media or the masses. The University of Leicester’s Lin Foxhall cautioned against resisting popular interest in Richard III, arguing that “For academics to suggest that the only important questions are the ones we ourselves formulate is arrogant and patronizing.” Second, it may simply bring into question what is archaeology at all—in some press coverage, archaeology does appear to be a particularistic story-telling mechanism that merely seizes on neat things like bones and valuables. Third, at what point is archaeology sacrificing scholarly rigor to allow a complex story to be boiled down to its most simplistic elements? Fourth, why are we fascinated by these bones at all? Even if we establish that this is indeed Richard III–and that case seems persuasive to me–archaeologists are still left to answer why these bones and so many other artifacts have such power and how we should wield that power in public space. Some of the apprehension comes from observers who worry that research agendas are driven by media or University administrators. Historian Catherine Fletcher, for instance, was cautious that “Amid the excitement over Richard III we should be conscious of how news values shape the history we see on TV and in the press. Imagine that the Leicester archaeologists had uncovered not a royal grave, but a grave of some peasant farmers, results from which completely changed the picture of what we know about human nutrition in the fifteenth century. Not so glamorous, but just as important in understanding the past – perhaps more so. … In an environment where marketing, PR and generating ‘impact’ are increasingly important for universities, it’s worth stopping and thinking about the values of historians, journalists and TV programme-makers.” Institutions like universities are eager to demonstrate “impact”: in the UK, impact is defined by the Research Excellence Framework system as “all kinds of social, economic and cultural benefits and impacts beyond academia, arising from excellent research.” The system assessing “impact” rates universities and has significant funding implications, so the term is by no means without political and material consequence. In the US, many universities and state and federal agencies are equally committed to demonstrating “civic engagement,” so many archaeologists in the US and UK alike are encouraged or even required to demonstrate the pertinence of scholarship. 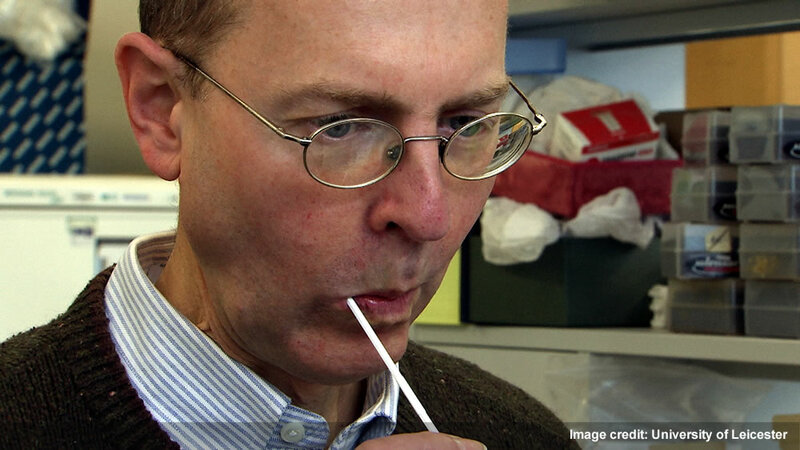 Michael Ibsen leaves some DNA on a swab to find out if he is indeed a descendant of Richard III (courtesy University of Leicester). For some academics, imperatives to address “impact” and “engagement” hazard turning academics into hucksters for their projects and melting the perceived distance between profit-driven institutions and the “pure knowledge” of the academy. Paul Lay sounded such a caution in The Guardian, noting that the Richard III presentation “does shed light on the future of history in this country. 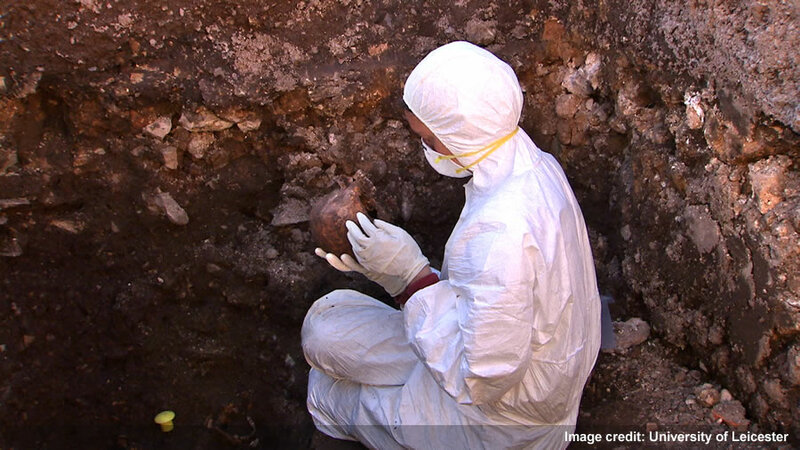 The University of Leicester, while rightly proud of the forensic skills of its archaeological team, has milked this for all it’s worth, abandoning impartiality … aware of the need to make the widest public splash in these days of impact. Leicester city council’s involvement, too, smacks of the imperatives of urban regeneration and ignores the fact that Richard found only death in the city where he will now be buried.” The implication is that such codes distort the scholarly process by making research take a form profoundly influenced by politicians, university administrators, local tourism boards, and the press instead of scholars. 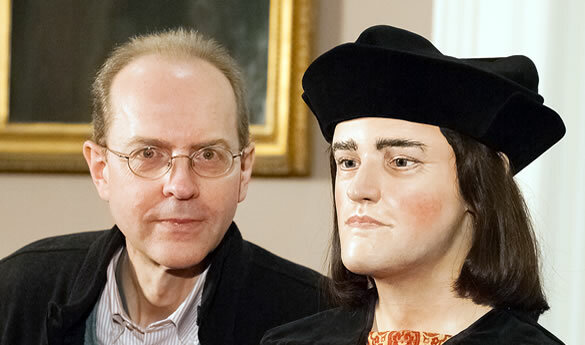 Michael Ibsen poses with a reconstruction of his ancestor Richard III (courtesy University of Leicester). The new face of Richard III (image University of Leicester). Pitts argues that while many historians and other academics may be new to sharing their research with the media and public, archaeologists have long been accustomed to sharing their material with the public long before peer review, including countless archaeological site tours, myriad local media stories, and museum exhibits. 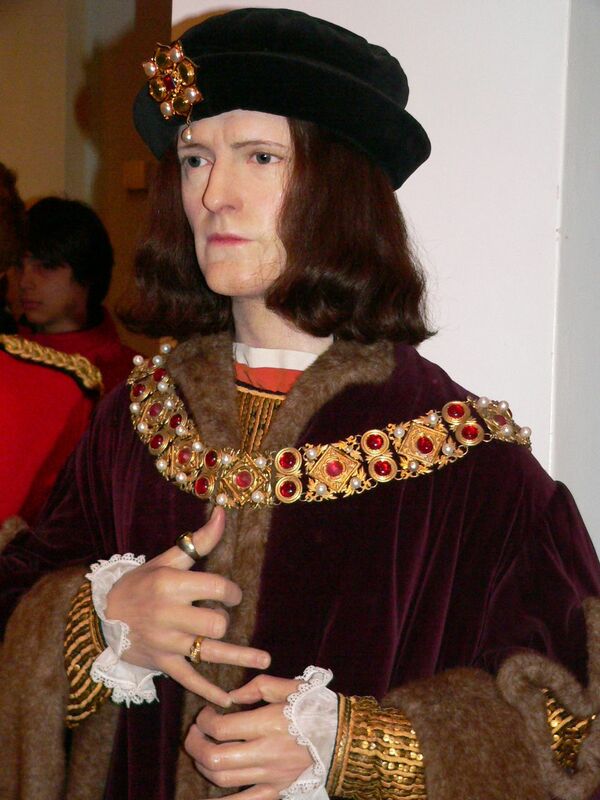 Lin Foxhall reminded observers that from the very outset of the project the Richard III analysis was being fervently followed, and while they knew there would be popular curiosity, the “extent or intensity of global media interest in the story surprised us, and has been almost unrelenting since then. We were very cautious in our initial announcement. We made clear that far more research was needed, that many different lines of evidence had to be explored and the results brought together.” As Foxhall argues, the Leicester team certainly was under unique pressure from a variety of quarters to share the results of their analysis and eager that those results did not get publicized by anyone other than the research team itself. What the Richard III findings once again underscore is that what we define as “significant” is inevitably shaped by the imperatives of politicians and state ideologues, the unpredictable imagination of popular interest, and scholars’ own experiences outside the academy. It is perhaps true that how University administrators respond to such directives is different than how scholars in the academy view them, and we all manage how we share our knowledge in distinctive ways: some of us focus on what we provide to students, others may conduct community-based projects, and some may embrace dynamic media-driven projects, but few academics can be stereotyped as the ivory tower scholar sequestered in the university working on some ancient text that is irrelevant to the rest of society. Yet the press in particular and public representation in general can provide challenges: reporters can be immensely willful and even a little bit over-important, they virtually never know anything about archaeology, and many archaeologists are wary after having stories twisted into forms we did not really intend. Much of the press’ attraction to archaeology fixes on its powerful visuality and materiality, which provides a compelling aesthetics as well as a truly tactile sensory dimension to narratives about alien places and peoples in the past, but those visuals, captivating details of the past, and the inexpressible imaginative curiosity they foster sometimes ignore the challenging stories archaeological scholarship can tell. It appears that the University of Leicester Archaeological Services tried to control the initial facts and telling of this particular story, knowing that what people make of it in popular culture is now out of their hands despite an effort to scientifically paint the case for attribution. This will indeed mean that some recounting of the story will lend it some narrative flourishes if not outright ideological interpretations, but the Leicester archaeologists probably aspired simply to control the fundamental facts of the archaeological analysis. That is sure to be simplified in some tellings and distorted in others, but this is simply what happens when powerful things evoke rich and contested pasts. We might conclude that archaeology is a poor fit to the “sound-bite” logic of most mass media and that any entrance of archaeological scholarship into popular culture inevitably simplifies it and hazards stripping it of all rigor. However, given the permanent public curiosity in archaeological data and narratives and the many governments that are committed to public scholarship, we are compelled to think about how we can share our interpretation. The problem with “real archaeology” is that it happens over long spans of excavation and analysis boredom punctuated by insights that sometimes simply surface in random conversations, are spurred by colleagues and community constituencies, or slowly emerge in the lengthy process of writing and delivering papers. That archaeological process is not especially amenable to many media representations that aspire to cut directly to the heart of a story and illustrate it with incisive quotations and captivating images. Instead, archaeology is less like HBO and a lot more like C-SPAN: that is, we work at the pace of real life while television, newspapers, and the internet slice that monotonous everyday life into its most apprehensible and interesting moments providing spectacular summaries of prosaic lives. We do not need to go the route of PT Barnum descending to mere performance artists, and we do not need to become Heinrich Schliemann weaving exciting but utterly contrived tales of discovery that simply portray who we wish to see in the mirror. But we do need to do our best to present archaeological knowledge in thorough and systematic ways and take advantage of the chances we get to tell people about all the compelling stories archaeology provides beyond finding a lost monarch’s bones. Posted on February 15, 2013, in Uncategorized and tagged #WPLongform, Leicester, Richard III. Bookmark the permalink. 2 Comments. Fascinating and thought provoking objective analysis of coverage of this extraordinary event, which provoked such a storm of news in the UK.